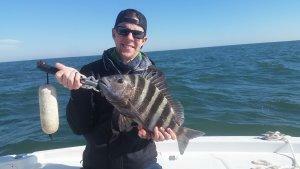 Our Fishing charters in Charleston and Folly Beach have seen plenty of nice catches lately. 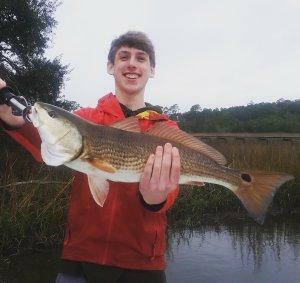 Resident Redfish have begun to gather up in schools on and near the flats and can be seen cruising and sunning themselves at low tide. We have been boating those fish using soft plastic baits by Z-Man and a variety of cut or live bait including shrimp and mud minnows. In either case a stealthy approach has been the key to getting the fish to bite. Sometimes this involves hunting on the flats and placing ourselves within casting distance of the fish. Other times we find ourselves sitting tight as the fish move towards us. In any case it can be a nerve wrenching event to see dozens of big Reds moving towards your bait. Keep your wits about you though because when one hits your line things will get chaotic real fast. 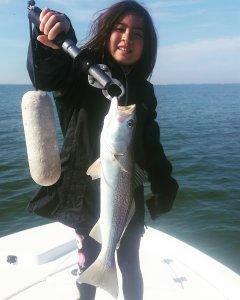 The Speckled Trout bite has been good wherever you can find some warmer water and current. These fish have been taking both plastics and live shrimp very well and when you locate them they seem to be appearing in solid numbers. 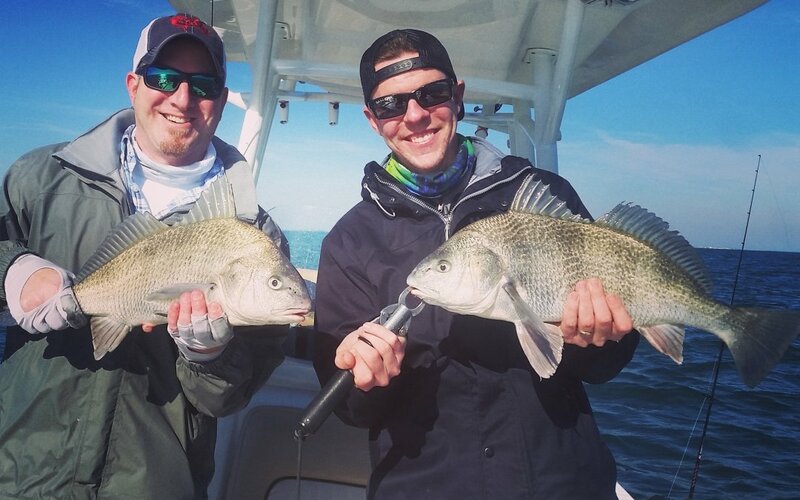 Deep Sea fishing charters at the nearshore reefs have been finding Black Sea Bass, Sheepshead, Black Drum and some big Bull Reds! These bruisers have been cruising the surface chasing live baits. 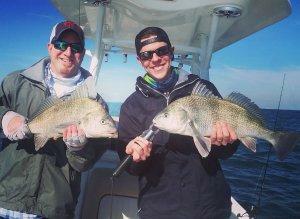 We have been able to catch them on top water plugs, metal jigs and soft plastics. Most of these fish are well over 30 inches long and have plenty of room to run when hooked so when you get connected be ready for a long fight! I expect January to provide lots of action this year so get to my online calendar and get your spot saved. I look forward to seeing you on deck soon!